IFFCO requires Accounts Personnel for its Field Offices located in various states/Projects/Establishment(s) of IFFCO across India. – Management has discretion to shortlist the applications for online test. – Minimum 3 years in Finance and Accounts with a large Organisation excluding articleship. UPPER AGE LIMIT : 30 years, as on 1st October, 2014. Upper Age limit is relaxable by 5 years for SC/ST category and 3 years for OBC category not belonging to creamy layer. Candidates having reading, writing and speaking knowledge of one or two more languages of Indian states other than the mother tongue will be desirable. Selected candidates may be offered the post of Accounts Assistant/Accountant in the pay scale of 14,500-25,500 /16,000-28,000 respectively. In addition they will be entitled to other allowances/benefits as per the rules of the organisation. The CTC will be approximately 5-6 Lakhs P.A. Eligible and shortlisted candidates will be required to appear for Computer based On-Line Test at the designated Centres throughout India decided by IFFCO depending on the number of candidates. Only those candidates will be called for personal interview who are short-listed on the basis of their performance in the online test. Efforts will be made to allot the test centre near to the address given in the application form. Request for change in the test centre will not be entertained. HOW TO APPLY: Interested and eligible candidates may apply on-line in the prescribed Application Form available thru the link “Click to apply on-line” given below till 31/10/2014 only. Any application sent through any other modes will not be entertained. 1. The applicants must fill the correct information in Application Form. 2. In the Application Form, the applicant’s name and Father’s name should be filled up exactly the same as appearing in their educational qualification certificate(s). 3. The applicants who are subsequently found to have filled incorrect information will be disqualified for test/interview/employment in IFFCO. 4. All communications to the shortlisted candidates will be sent through E-mail or SMS on the mobile number given in the Application Form. 5. The candidate must save the Application and take a print out of the same for future reference. 6. Management reserves the right to shortlist the applications in case a large number of applications are received. 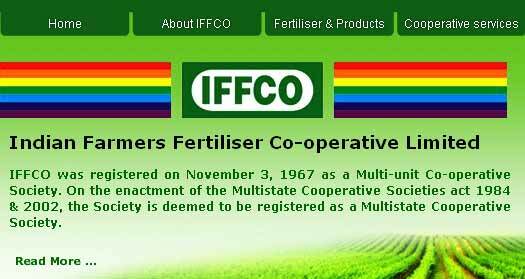 IFFCO has sole right to accept or reject any or all applications.